We are pleased with the product. Pretty impressive speed and quality given that the unit is relatively small and can sit comfortably on a desk. Our office isn't very big so size was an important factor. One disappointing issue is that it doesn't appear that you can feed in a mixed size document (A4 report with A3 drawings in the middle). The software will chop the ends off the drawings thinking it is an A4 sheet. There are work arounds but this is a little annoying. 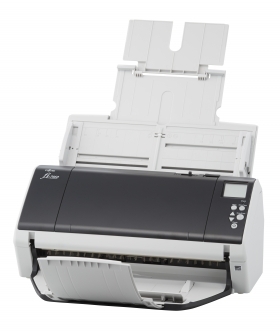 The fi-7460 is ideal for office use as the smallest A3-capable scanner of its class. Its wide range feeding ability includes regular A8 to A3 sizes, as well as folded A2 documents and plastic cards. Additionally, no burdensome pre-sorting is required with mixed batch scanning. fi-7460 scans at the high-speed of 60 ppm / 120 ipm (A4, landscape, Color, 200 / 300 dpi). It can also recover from power-saving mode (sleep mode) in a second or less, enabling users to scan immediately and continue work seamlessly without pauses or interruptions. It can support a wide variety of media. The paper feed mechanism can handle both thick and thin paper (27~413 g/m2), enabling users to scan documents without the concern of paper thickness. The fi-7460 can efficiently scan a large amount of documents. The ADF paper chute (feeder) can accommodate 100 sheets (A4 sheet, landscape, 80 g/m2) and additional papers can be added while scanning. Furthermore, it also includes several functions to ensure reliable scanning. This function is the first in its class(2) and controls paper output speed so that documents are not piled up in a disorderly fashion. This increases work efficiency as no time is spent realigning messy stacks of papers. The adopted functions, such as the Brake Roller, which separates each document, and the Skew Reducer, which assists in feeding mixed batches, are highly reliable and enable easy digitization. Additionally, each Hopper Side Guide moves independently, so you can easily adjust them to the document width for efficient scanning in mixed batches. Even if documents are creased, wrinkled or when staples were not removed before scanning, Multi-feed Detection and iSOP (Intelligent Sonic Paper Protection) technology protects both the physical documents and the scanner hardware from potential damage. This helps improve and maintain work efficiency. Users can also utilize Manual Feed Mode (so that the scanner waits for the next document to be placed within a specified time) for scanning where you need to check the contents of each document or delicate documents that may cause multi-feeds or paper jams. Built on TWAIN / ISIS standards, PaperStream IP is the scanner driver for Fujitsu fi-series image scanners. With its advanced black and white and colour processing, a range of documents can be automatically and easily converted into image data suitable for complex post capture processing -producing for example highly accurate OCR results. High quality image data can be created without defining scanner settings in advance, as PaperStream IP will aim to optimise this automatically for every sheet.